It is with the greatest relief that I note the passage of two headache-free days, for the first time since July. Finally, something that seems to work at stopping the awful pain. After my doctors told me I was risking potential adverse side-effects from other pain relievers, I declined to use NSAIDs any longer. I was taking dangerously large overdoses seeking to get rid of headaches, and it wasn't working anyway. The neurologist finally prescribed a drug that was developed for migraine relief. It seems to do the job. I am very pleased. The medical community finally comes through with something that actually works for me! Woohoo! Let's light off a few fireworks! Yes, I am very pleased to be without headache, for what now seems like forever. Of all kinds of pain, I find headache pain most incapacitating. It wears me down, and if I try to push through it, the stress and exhaustion gives rise to other symptoms. I wonder if some of the other phenomena you described in your Intermountain Health Care post might ease up now, like the scotoma. I experience scotoma when I've pushed too hard, haven't eaten properly, have kept myself busier than my life can support, etc. I didn't know what it was called till you gave me a name for it, but I've had it off and on since my first pregnancy. BTW, in the course of your celebrations, stay away from those caffeinated beverages. If you crack open a Mountain Dew and I catch wind of it, I will descend upon you in the fullness of my wrath. Thanks, I have not tasted a soda of any kind for several months, and have no desire for any. BTW, my Forest Service associates accused me of being an addict to Mountain Dew, but I was never that engaged, just a habit. Many of them were seriously fanatical about health regimens, and took offense that I would presume to mistreat my body with such casual indifference. Maybe part of my habit was in defiance. Look where it got me. Scotoma is a very strong indicator of migraine -- along with myriad other weird manifestations. We could make a whole new thread, just on the migraine topic. Ooo, a whole thread on migraines. I understand your clinical interest, migraines being one of your areas of expertise. If you want to describe and explain migraines, especially your migraines, lead and I will follow. As an aside, we received about an inch of snow last night. Now it's very cold. When my husband and I drove up to Moab the day before yesterday, he bought me an early Christmas present, a nice pair of Marmot brand gloves. Looks like I'm going to need them now. I dug out the shell for my fleece jacket. If life goes well over the next thirteen hours, I'll probably step out for a walk tomorrow morning. On the way home from Moab, we nearly bagged one of those highway deer. Or were nearly bagged by one. Empty stretch of desert highway, nobody coming ahead of us, nobody coming behind us, and the buck darts out into the road in front of us, right around that astounding Hole-In-The-Rock tourist trap. Always good to make it home. Oh yes, and that's good news about the soda. Very good news. What Forest Service district did you work with? I have worked temp or contract for the USFS, one summer in the Ashley, two in the Manti La Sal, and one for Rocky Mountain Research Station based in Ogden, which included field work all around Utah. Also did work for the BLM in Oregon, and last year in Beaver County, Ut. Hi Jim! Still headache free? How about Wednesday or Thursday for more scanning? Let me know when you're free - I know you have a busy schedule of rehab and all. I haven't read your blog in awhile. I didn't know about your scotoma. Are they improving? Mine are usually worse when my PTC is worse. Brain stuff is so weird. I really want you to push for a spinal tap. You have to be your own advocate with your doctors. At your next neurologist visit, ask about the condition of your optic nerves, and ask for a spinal tap. I'm also concerned about your tinnitus. Also, Darrin said you have the sound of firecrackers in your head, followed by pain. I get that sometimes too, also PTC related, I think. This is one of those symptoms you try to explain to the drs. and they look at you like you're a loon. Very amusing. You know I've always believed you have PTC, and it could explain the strokes. I'm so glad the headache is gone, but I'm so nervous still about things coming back. If you could just get your neuro to check your spinal pressure, you could find out if you have intracranial hypertension and get some treatment for that as well. The treatment isn't particularly effective, aside from the spinal tap itself, and draining off the excess fluid. But if you know what you're looking at, you know better how to fight it. I think we could resume the scanning project on Thursday. I will ask about PTC when I visit the neurologist today. 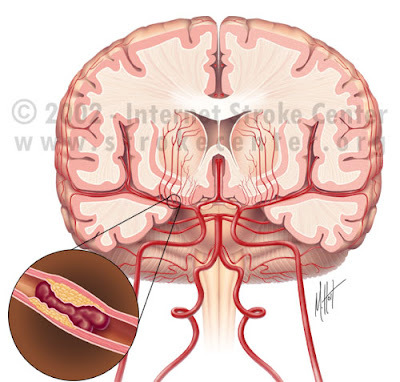 Better explanation for cause of my strokes than what they came up with. Most of the doctors took a look at my 300 pounds of fat body, and knew I had blocked arteries. No matter that none of their scans showed any such thing. Nor did it matter that I did not fit the profile in several other respects. I am not diabetic, nor physically inactive, which they simply ignored in their medical diagnostics. The doctors at Utah Valley simply abandoned any effort to determine the source of my arterial blockage. They were satisfied with treating secondary symptoms, because they assumed that my cholesterol-laden blood was the real culprit. But as it happens, I have low cholesterol. So that doesn't fit the standard write-off either. Now that I have lost so much weight, and continue with the same problems, perhaps the doctors will not so quickly conclude their diagnostics. When I asked the guy at Utah Valley what I should do last week, he suggested that I should start consulting other doctors in the area. Basically, gave me a nice pat on the back and wished me good luck. The other family practice guy said pretty much the same thing. Really gives a lot of confidence in medical support, doen't it? Good morning, Jim. I'm going out this a.m., into the snow and mixed light. No sitting on ledges today--too cold. The weather calls for solid walking. If anything interesting happens, I'll write it up for you. It looks like you're getting helpful comments about medical options. Hopefully, something will pan out. I'll look forward to your rehab update. I hope today's visit to the neurologist goes well. The drug prescribed by the neurologist was actually developed to treat seizures. They call it "zonegran". Apparently, it finds application for a number of cases of otherwise intractable migraine. A most curious thing, I cannot imagine how doctors would come to discover such a property of a particular drug, especially one that was invented for some altogether different purpose.